Why Is Public Speaking Important for Experts? Speaking gives you a chance to flex your credentials directly in front of a live audience. With qualifications and evidence to back up your words, you’ll be able to connect with people and prove your expertise. Answer their questions and solve the problems no one else has solved for them. Be valuable — or better yet, invaluable — to your audience and potential customer base. Gaining a profile, especially online, can be particularly difficult. Therefore, speaking engagements can be an incredibly effective way for businesses or individuals to show off their expert muscles to a live crowd. Speaking also allows you to build trust faster and more personally than other methods. This is a chance to be directly in front of your audience, which is essentially a group of potential customers. You couldn’t ask for a more direct marketing opportunity. Face-to-face communication is persuasive; we use and interpret body language much more perceptively than other forms of communication. Your chances of coming across as an expert in your field are multiplied several times over simply by being able to look someone directly in the eye while you’re convincing them. Speaking also allows you to garner more interest in your message and gain a loyal following. Huge followings indicate expertise. Those who have the best reputations and biggest social media followings and are the most well-known tend to be known as experts. Add a call to action within your speaking engagements and watch your business grow — and your recognizability along with it. Public speaking also gives you a chance to build up your network and connect with people face to face, meaning you have a chance to be memorable and provide an experience that resonates in the minds of potential customers. The message is more urgent, catch phrases will stick better, and logos will be remembered if they come with a funny anecdote. You’re not just selling your product or field anymore. You’re selling yourself, your personality. And when people are emotionally connected with you, they’ll be emotionally invested in you as an expert. By getting your message out, building trust and flexing your credentials, you’ll raise your value as a speaker and as an expert in your field. The people who come to watch you speak will come to trust you more. The more you speak, the more influence you’ll gain. 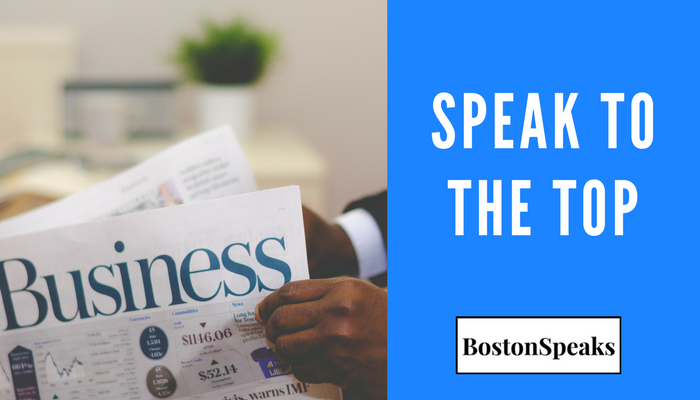 While speaking at one event will garner interest and buzz — which is a huge plus for your business — a successful and popular speech should result in you getting booked again. Make a splash on your first outing and make yourself memorable. Getting booked continuously is like anything else in life: practice makes perfect. The more you speak, the more persuasive your talks will be, and the more authority you’ll gain as a speaker. Each event makes up an additional notch on your belt, meaning more perceived expertise, greater authority, and a wider audience for your message. It’s a snowball effect, cumulatively adding value and influence attached to your name. And with a bit of luck and some hard work, you’ll soon find yourself named the foremost expert in your field and in high demand for speaking events all over the world.